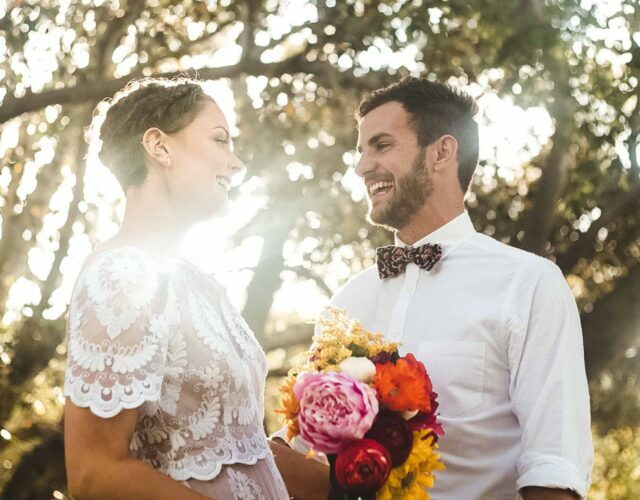 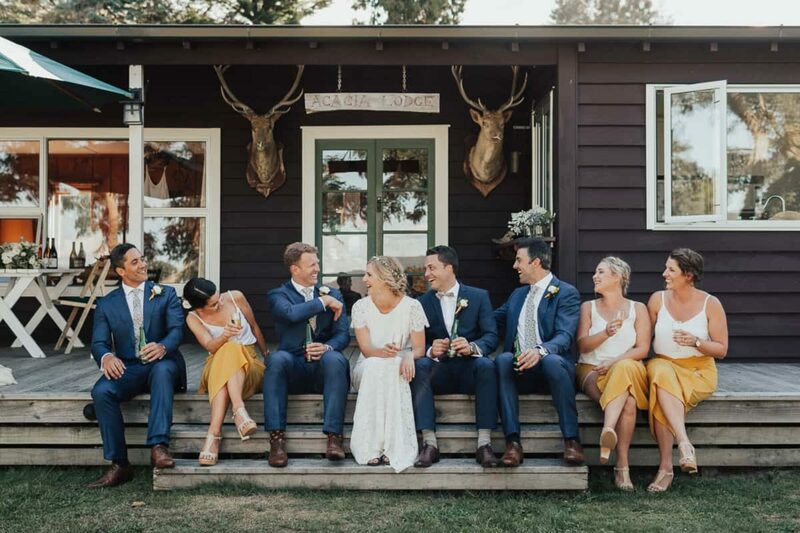 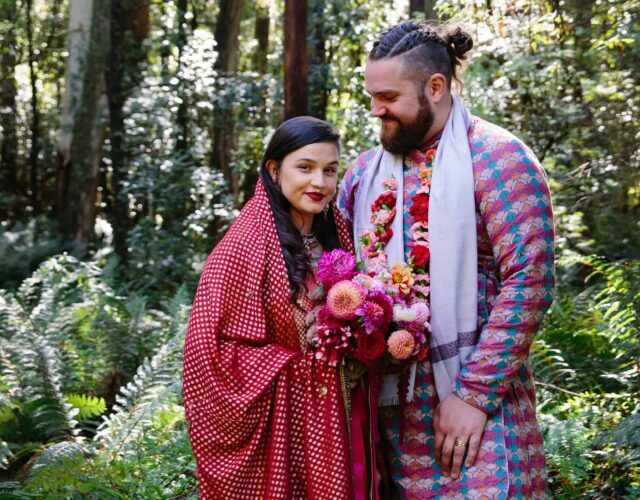 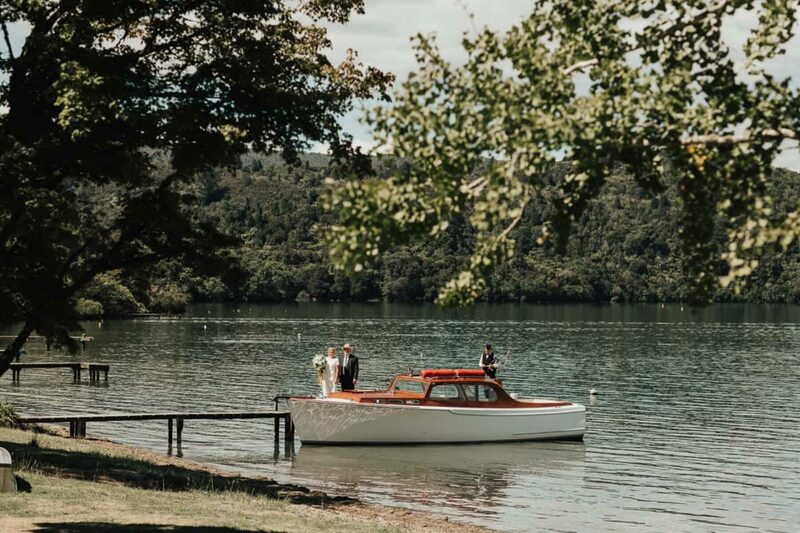 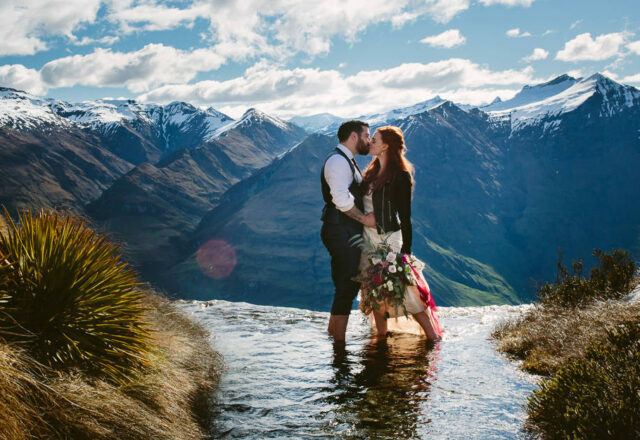 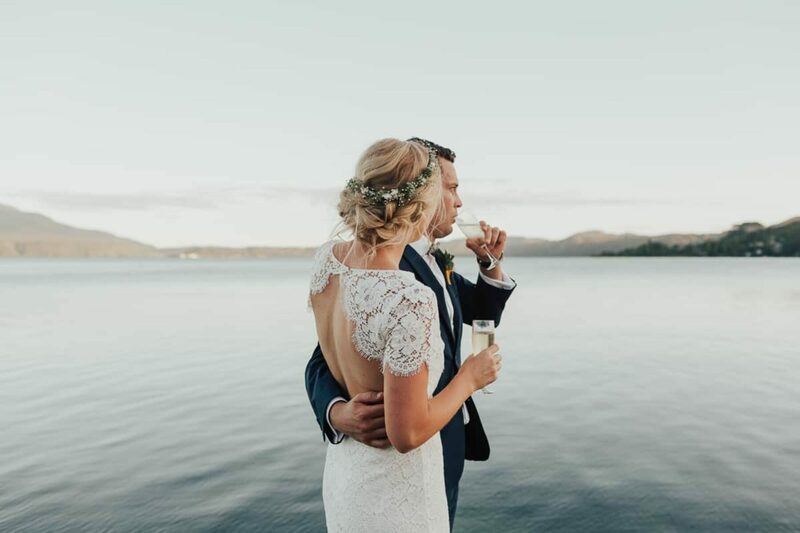 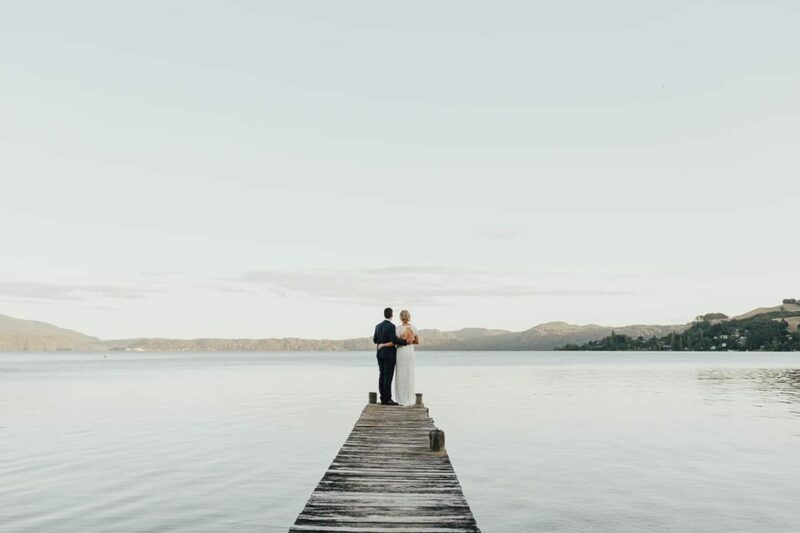 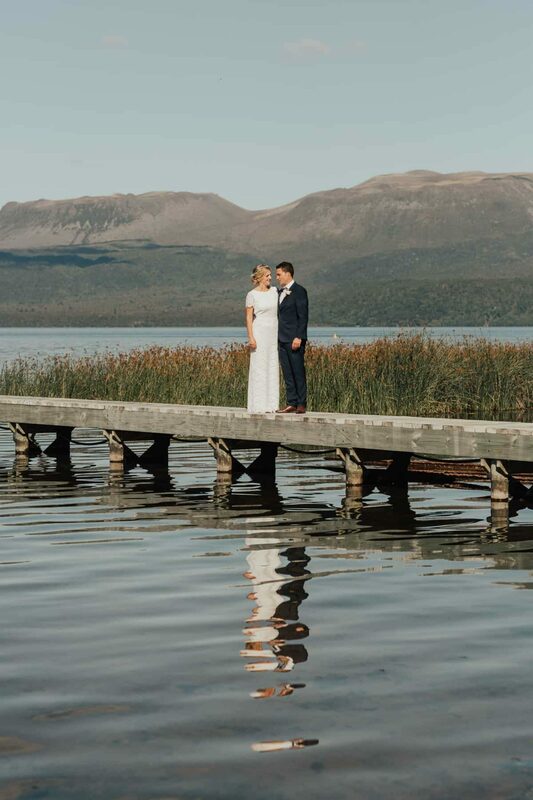 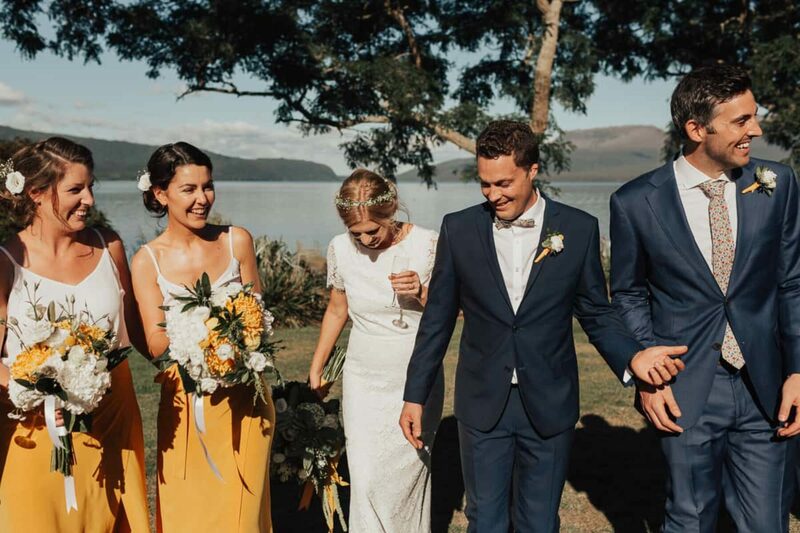 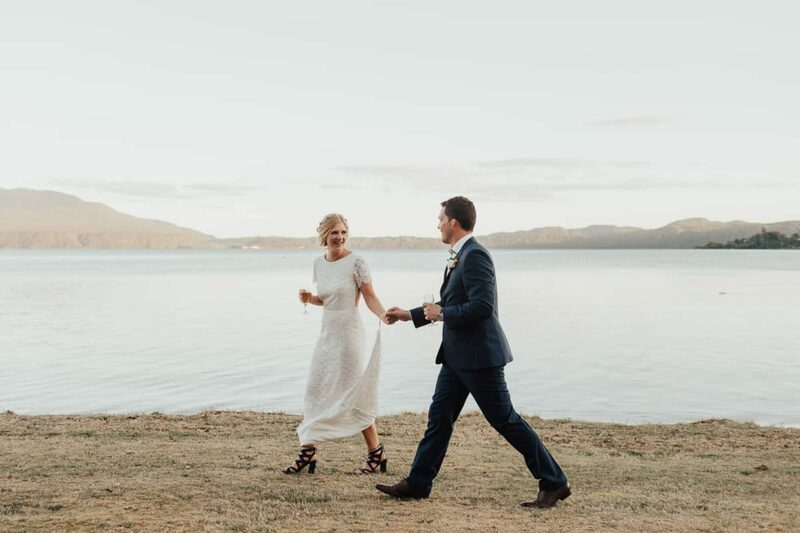 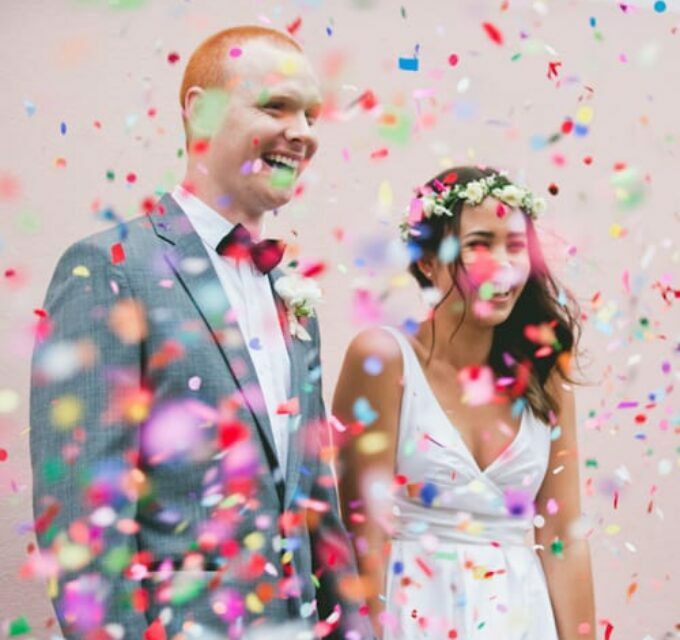 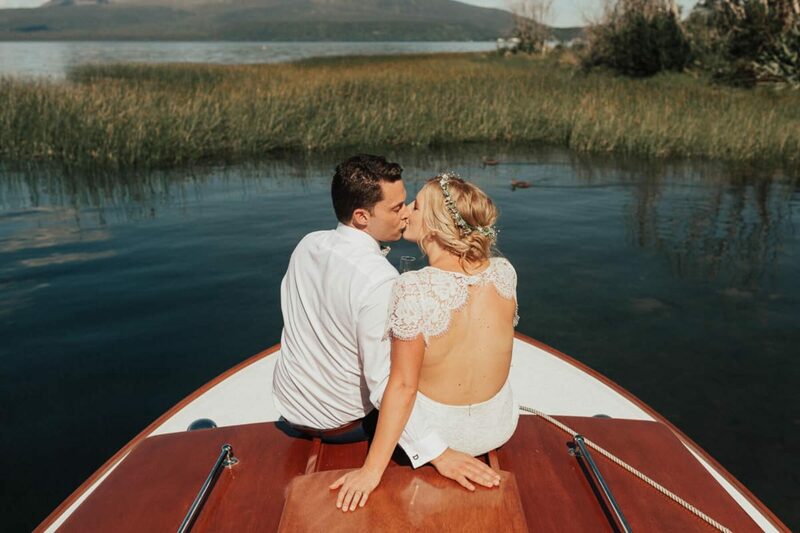 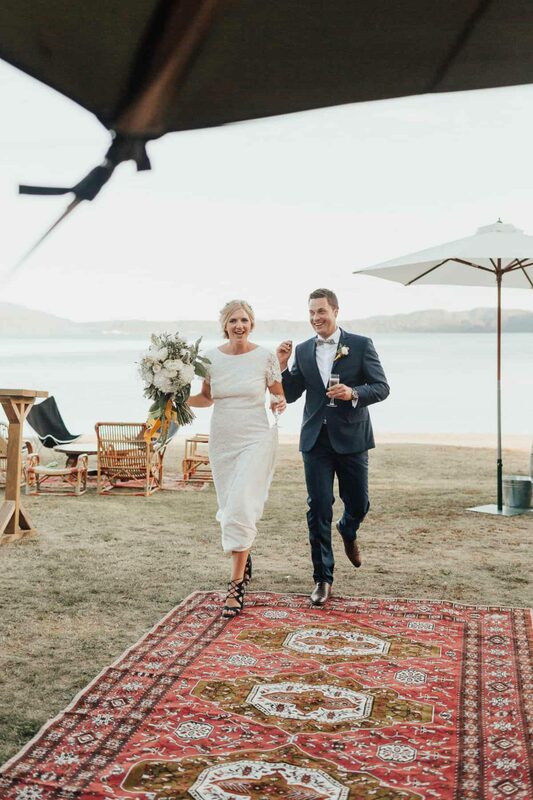 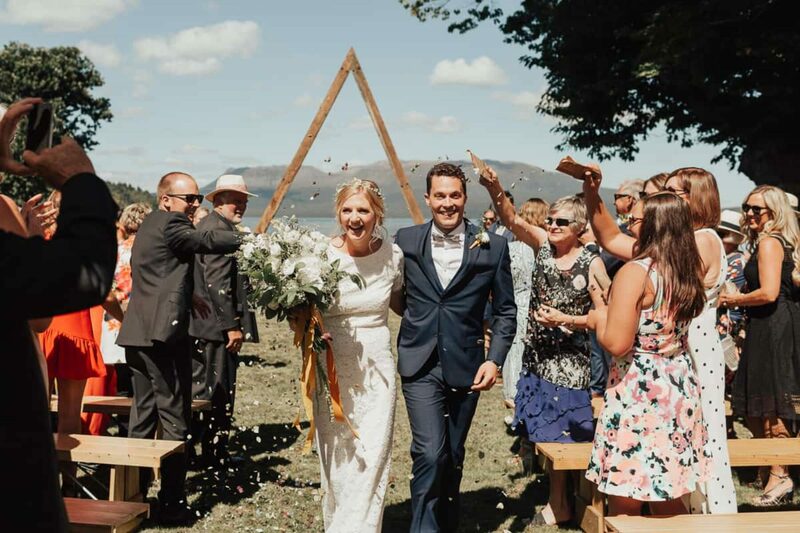 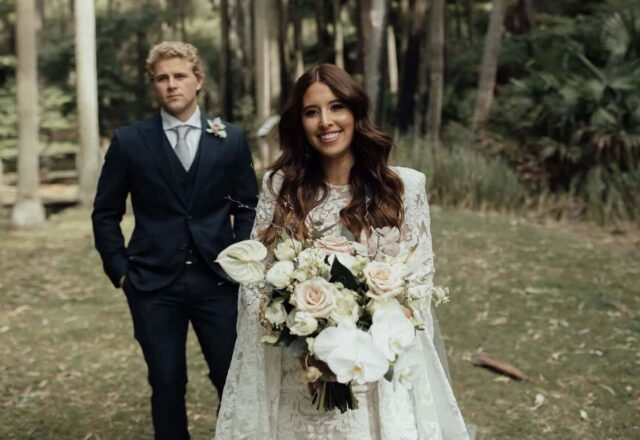 It was only when they met as adults that Sophie and Ben realised they had grown up across the water from each other at Lake Tarawera in Rotorua, New Zealand. 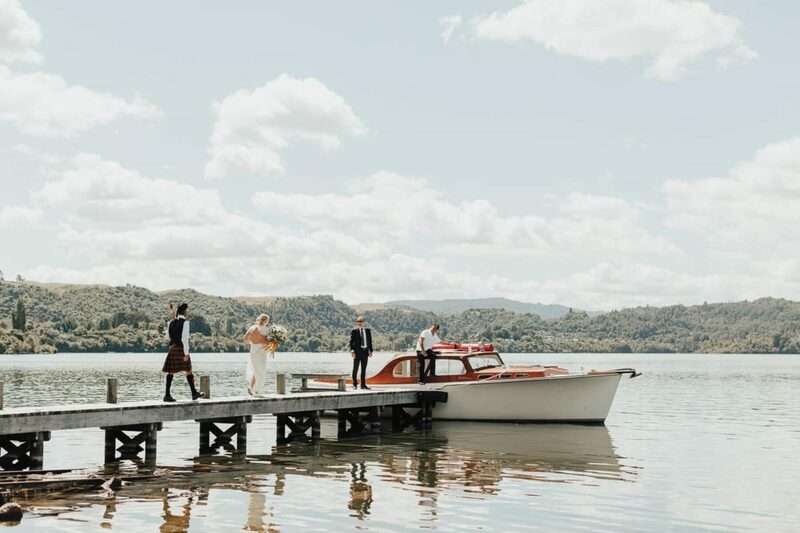 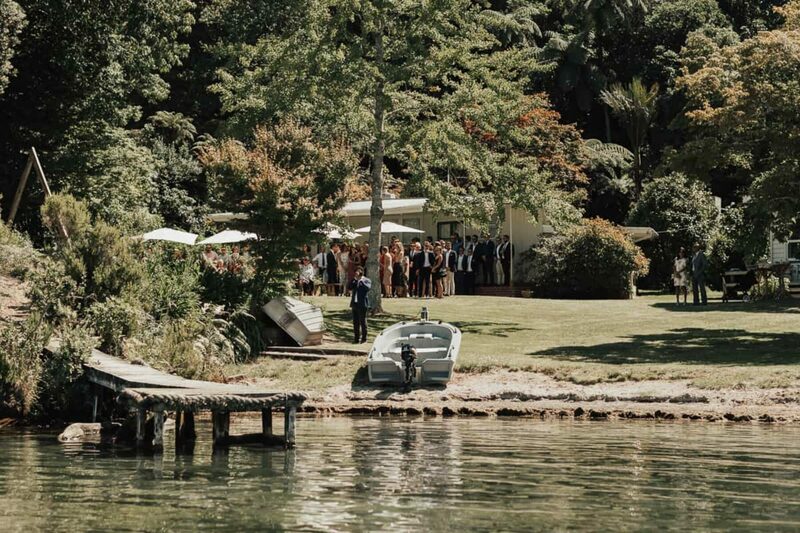 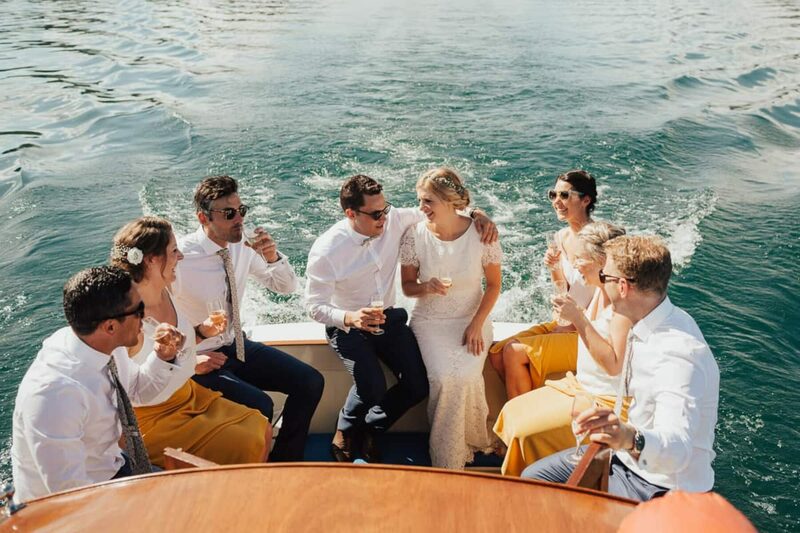 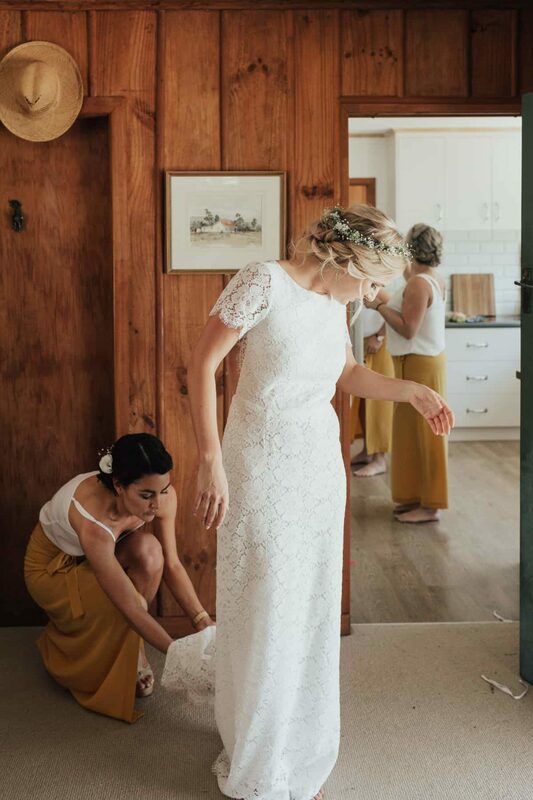 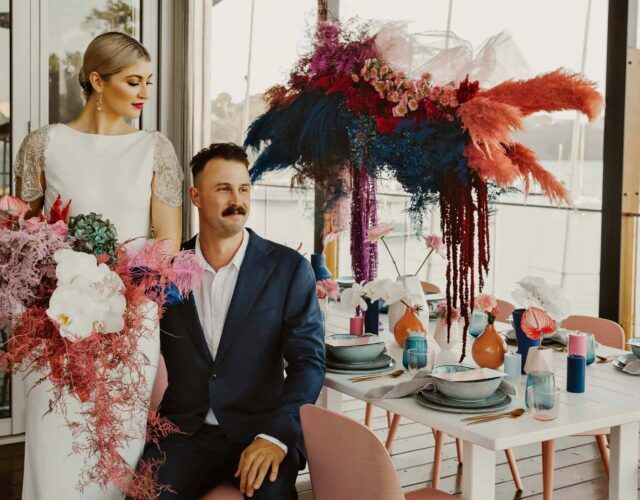 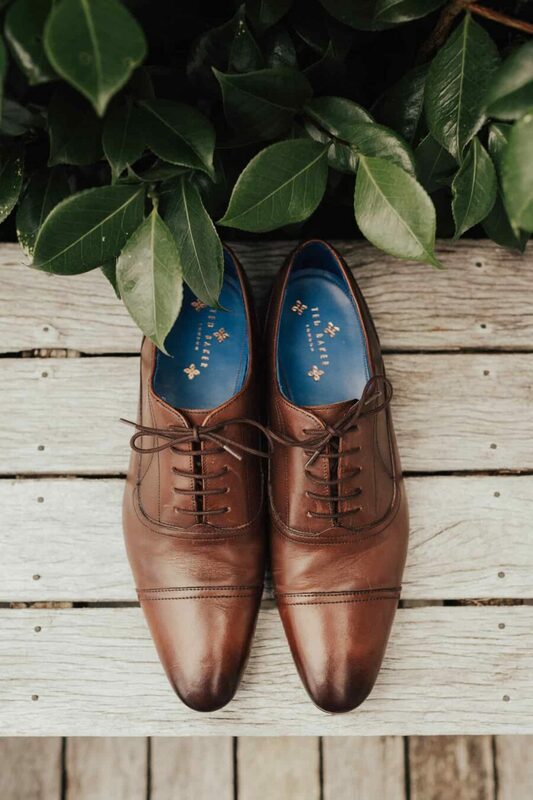 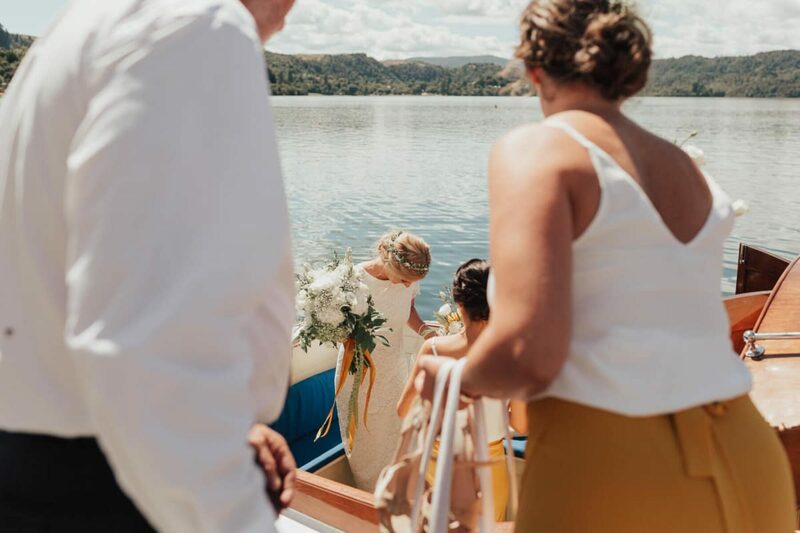 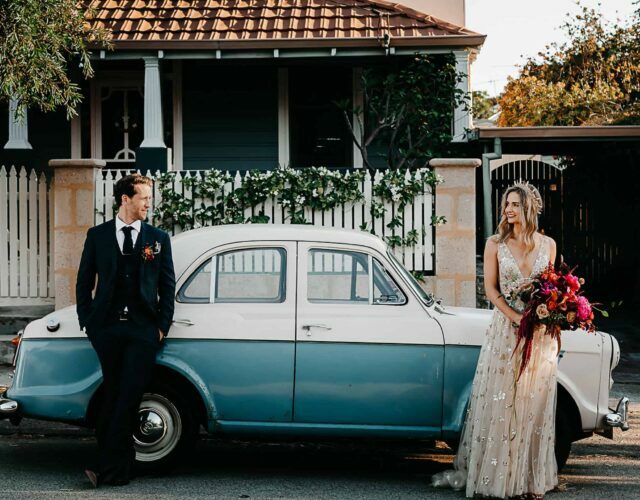 These two drew plenty of wedding inspiration from their childhood home to create a relaxed and stylish lakeside affair, captured by Bespoke Photography. 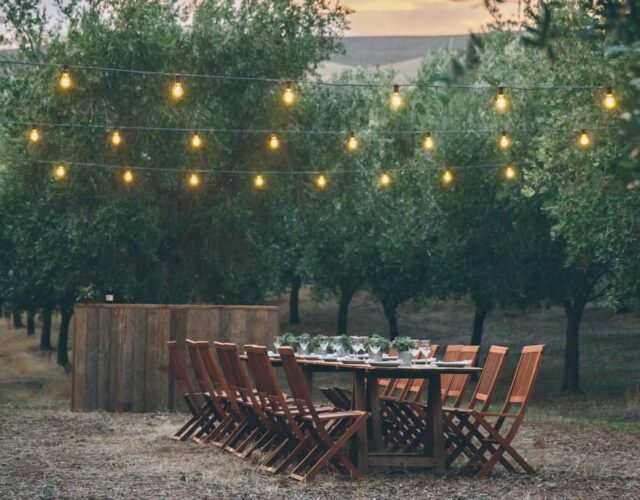 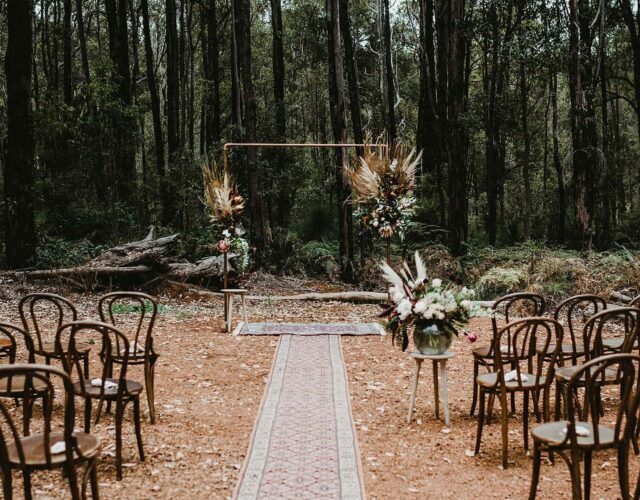 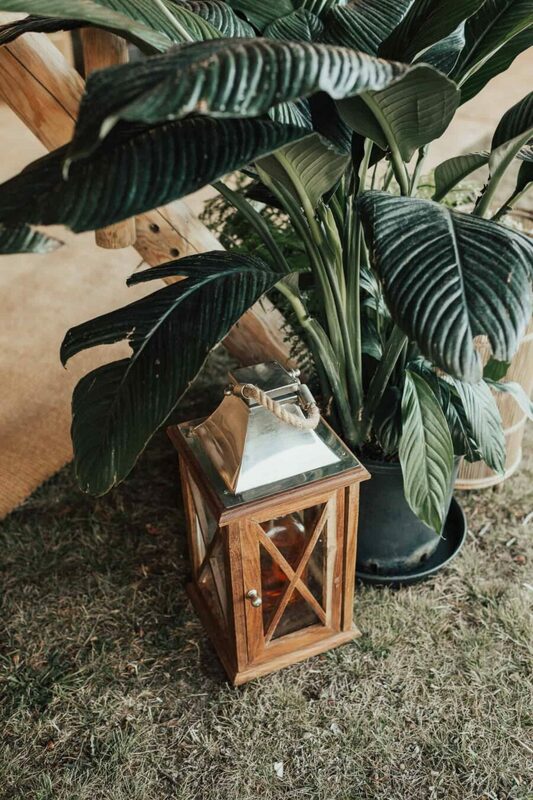 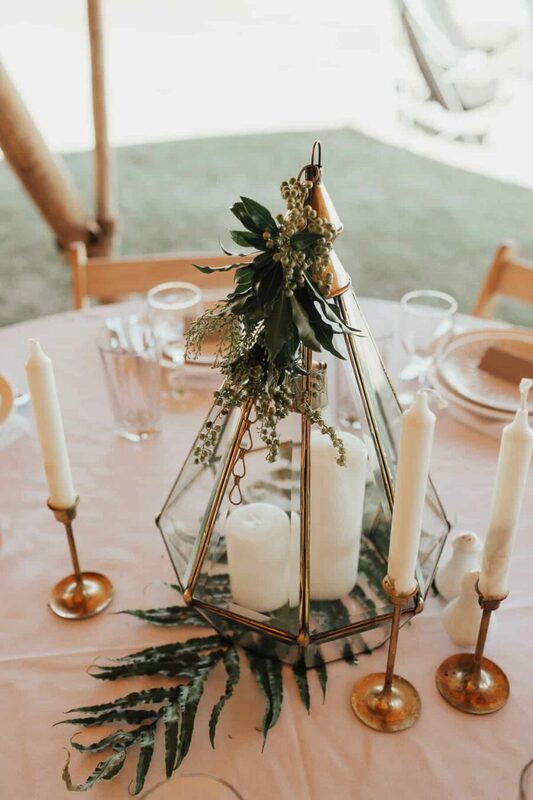 The celebration continued back at the reception with plenty of greenery, warm tones and statement pieces, like those amazing brass lanterns, sourced from Royal Laboratorie. 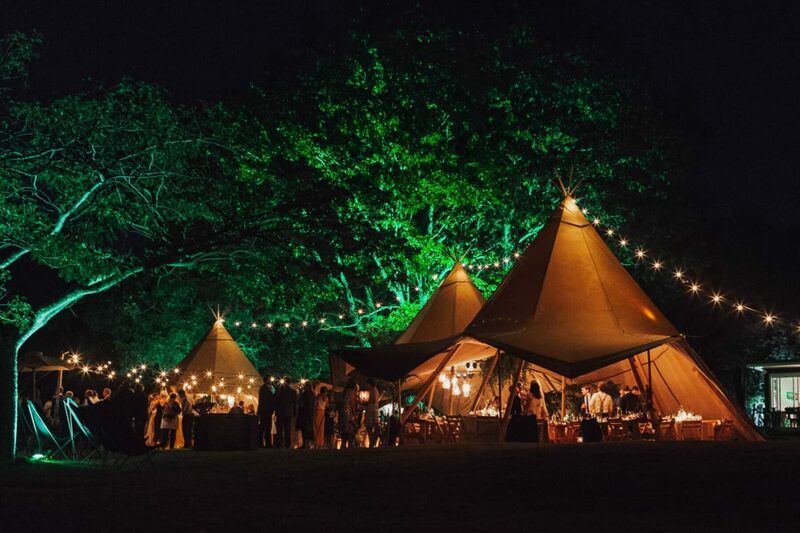 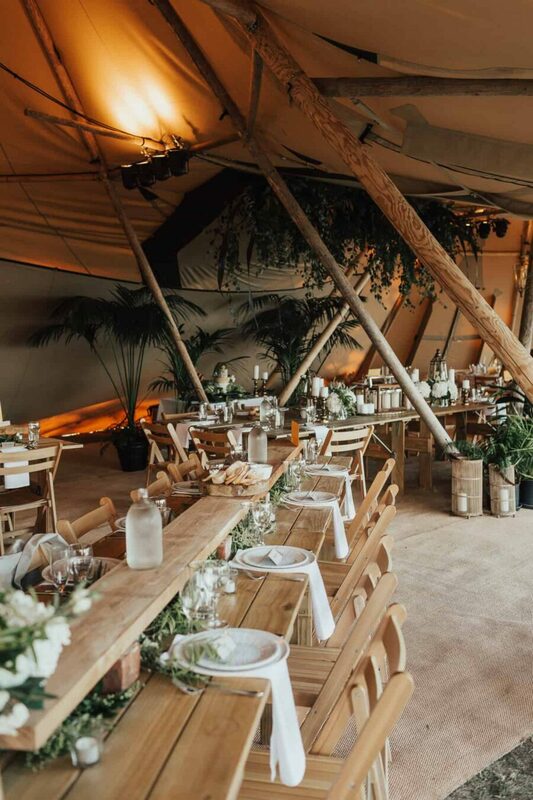 Not wanting to go the white marquee route, the couple opted for Scandinavian style tipis from TopKata. 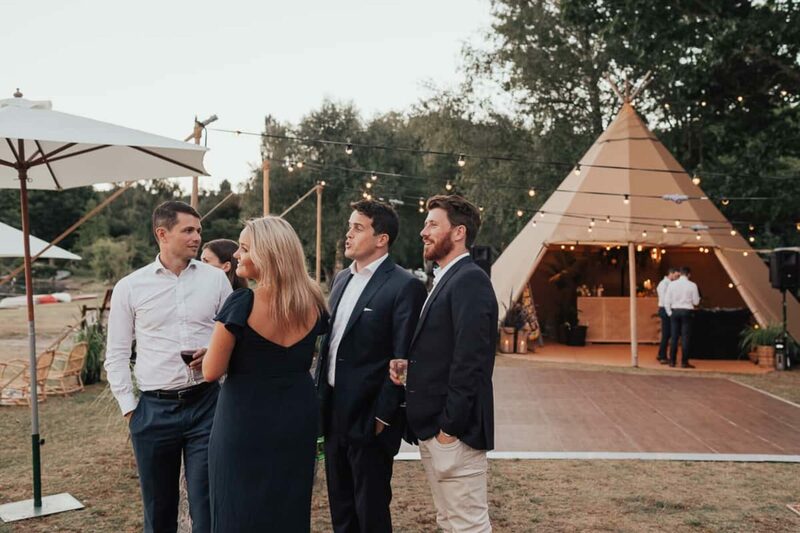 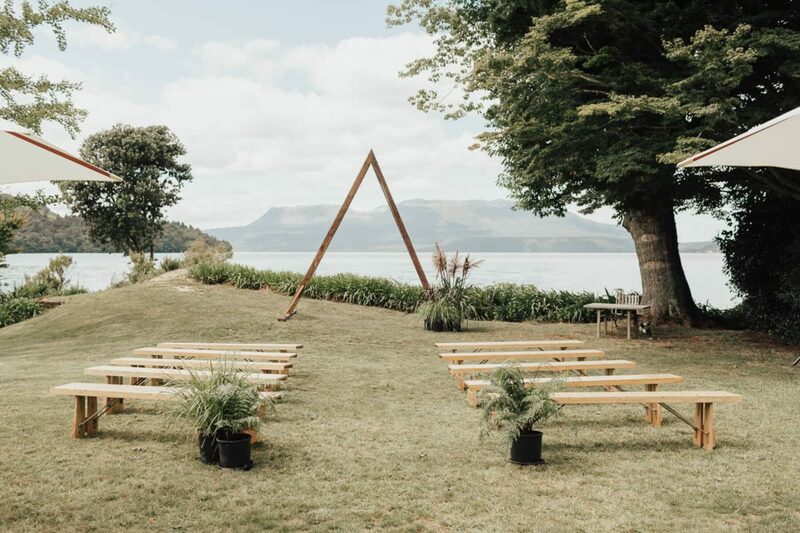 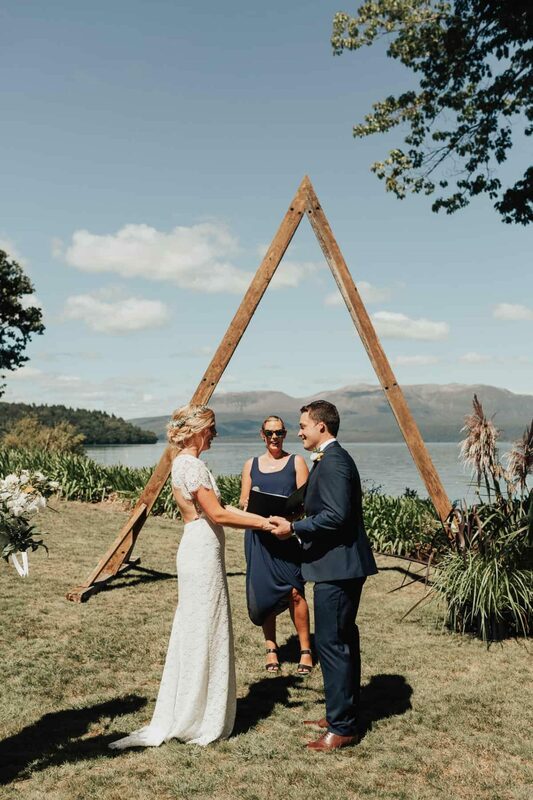 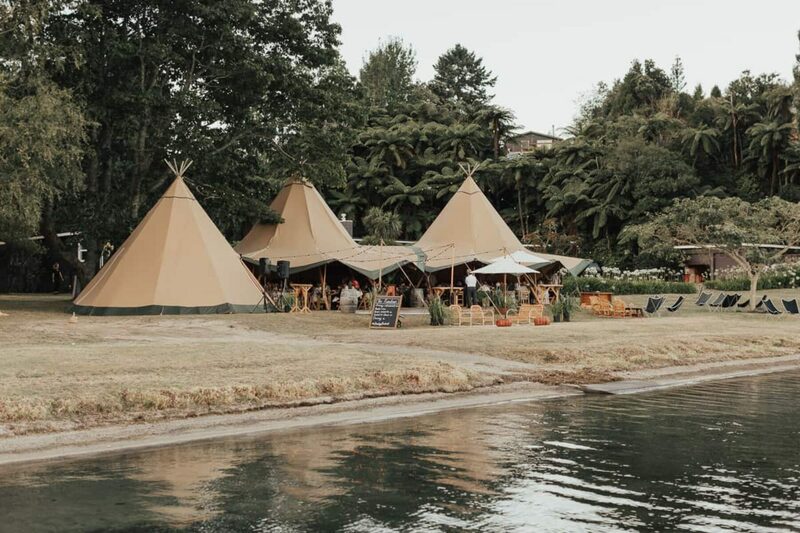 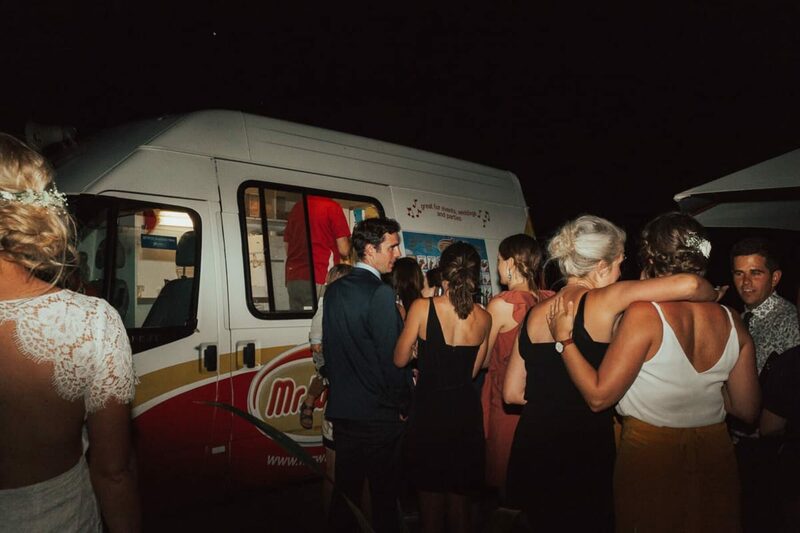 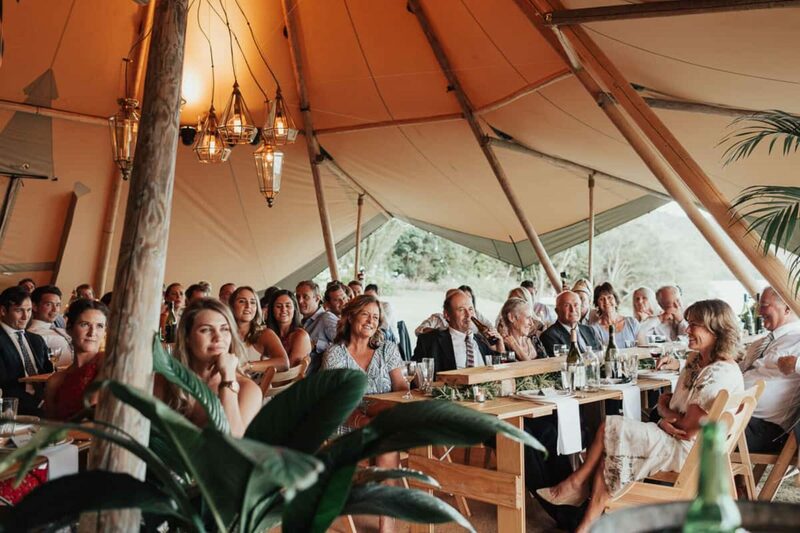 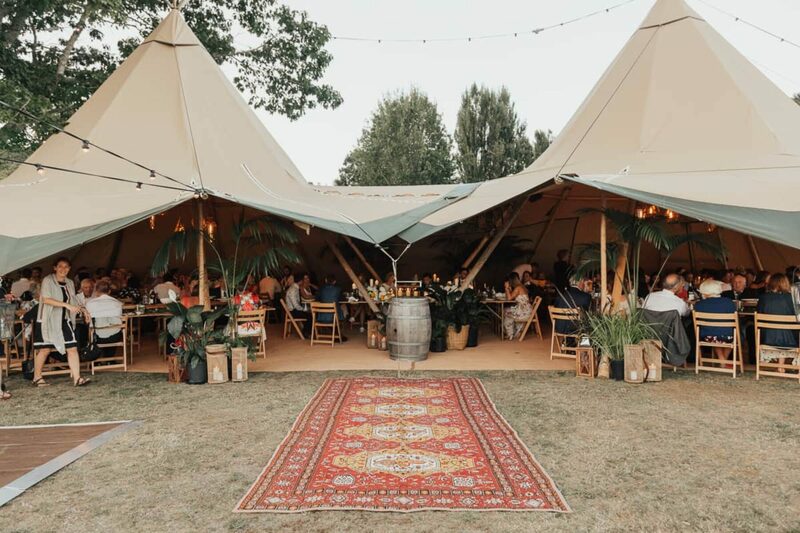 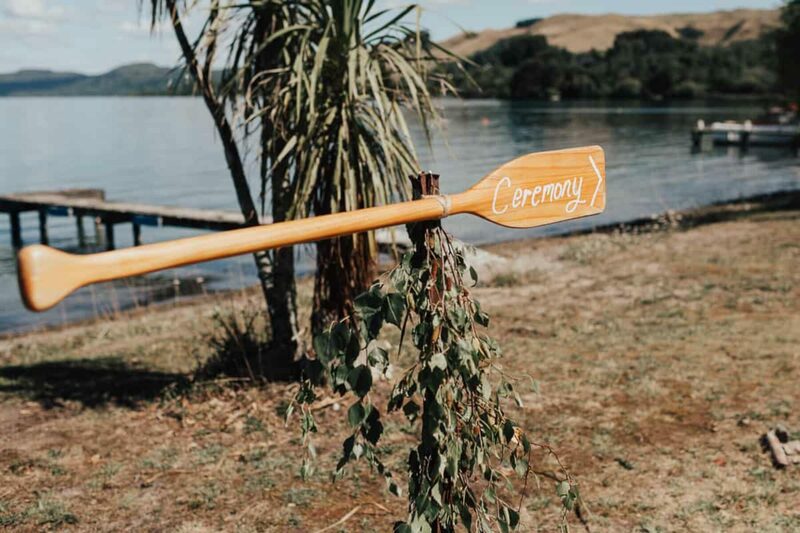 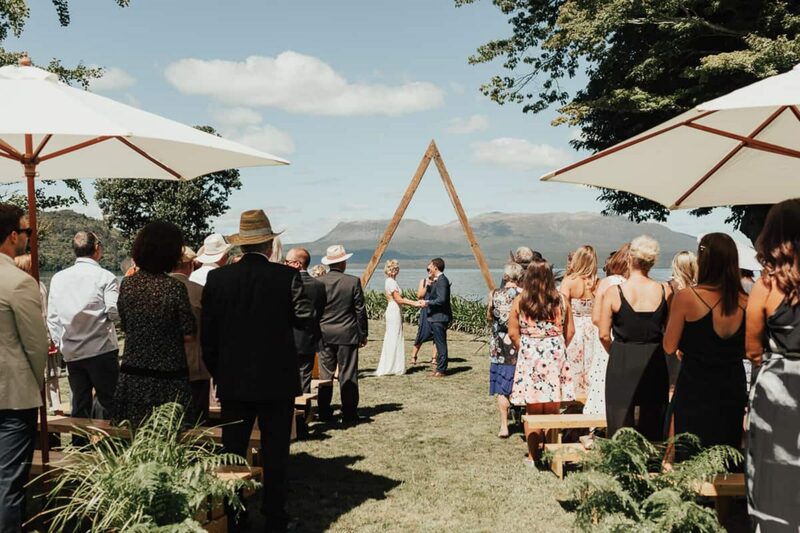 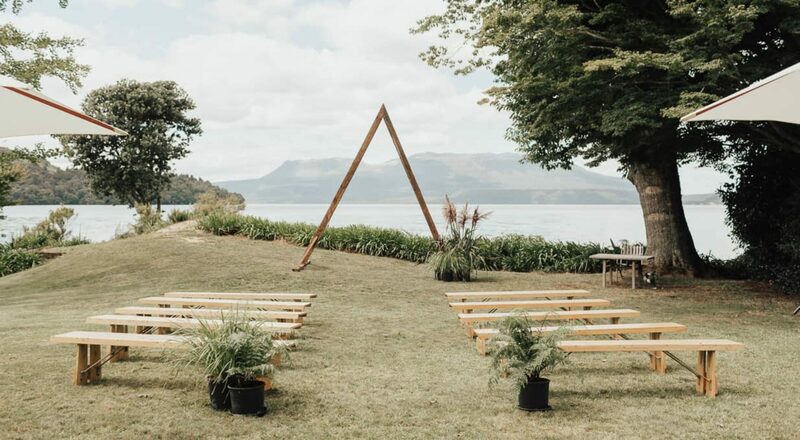 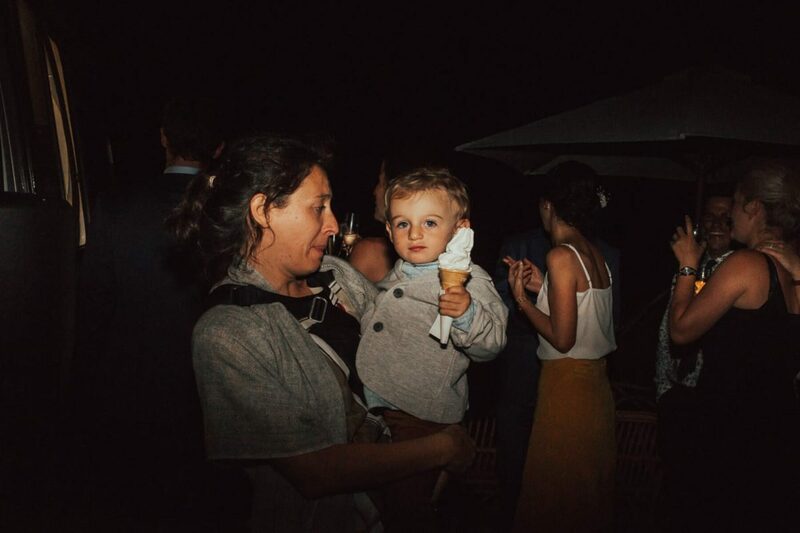 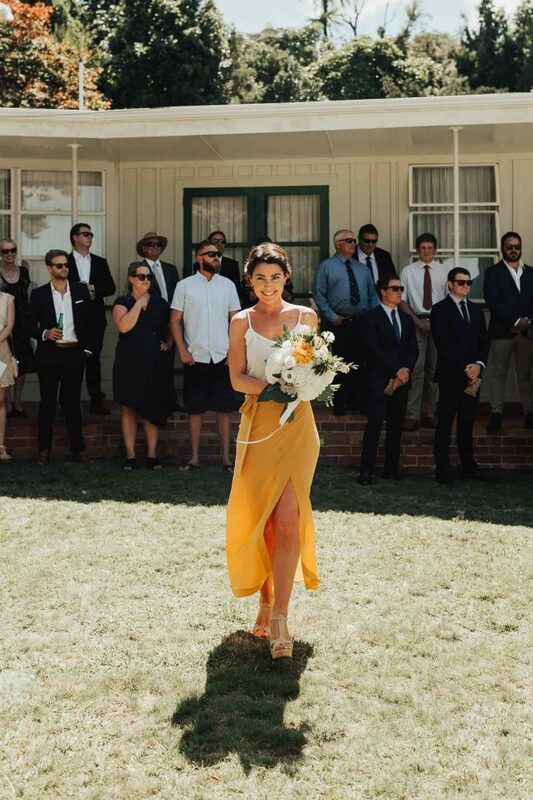 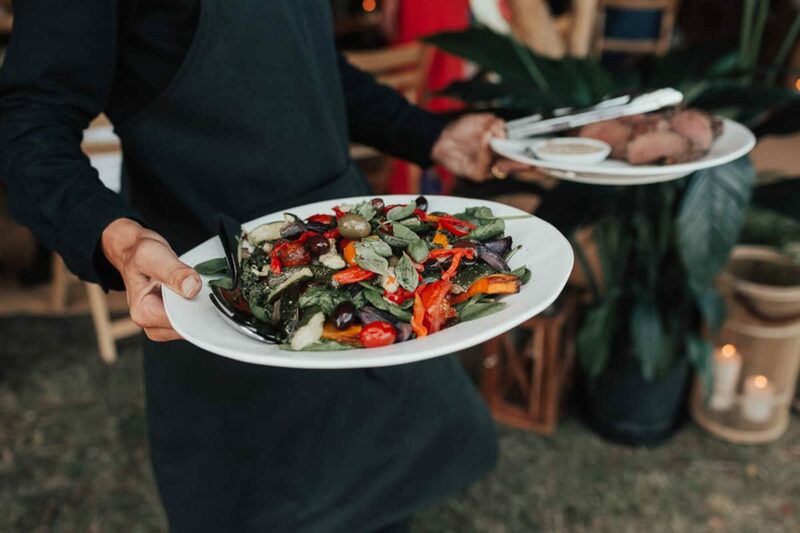 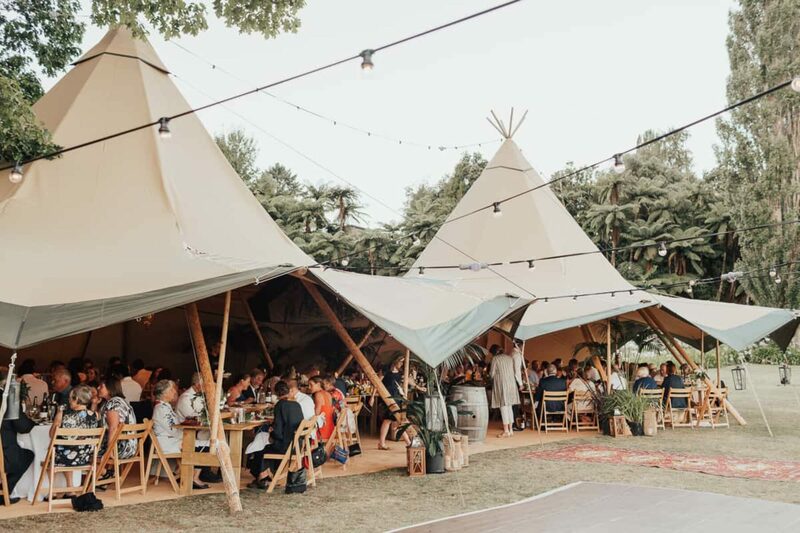 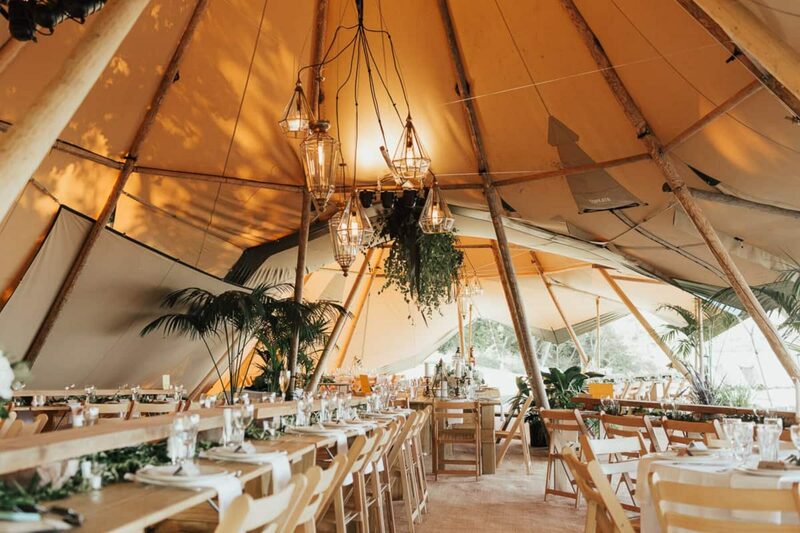 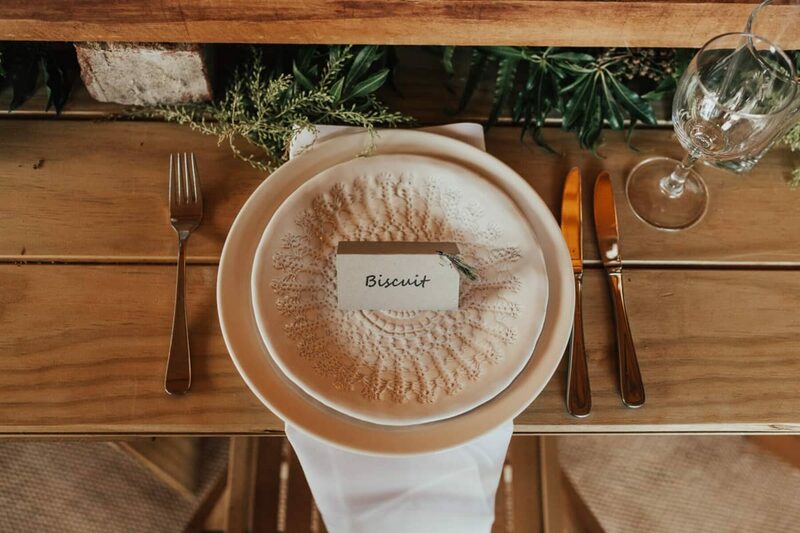 “The tipis really set the tone for the wedding and I loved how we could open them up to the lakefront to make the most of the views.” We’re loving the Nordic minimalism meets tropical island feel, and getting your guests to line up for Mr Whippy is somehow cuter than queuing for cake. 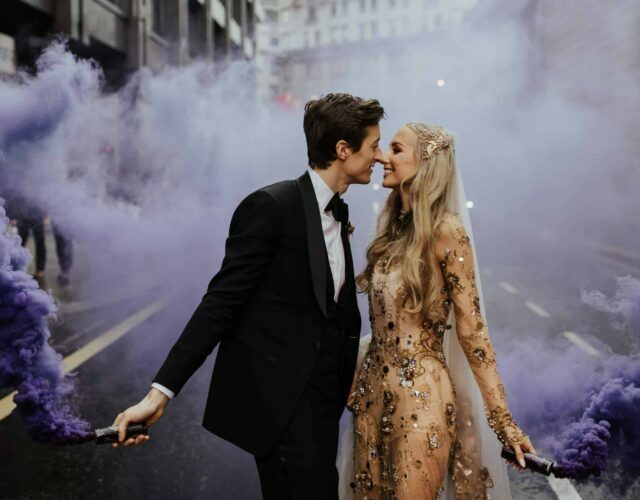 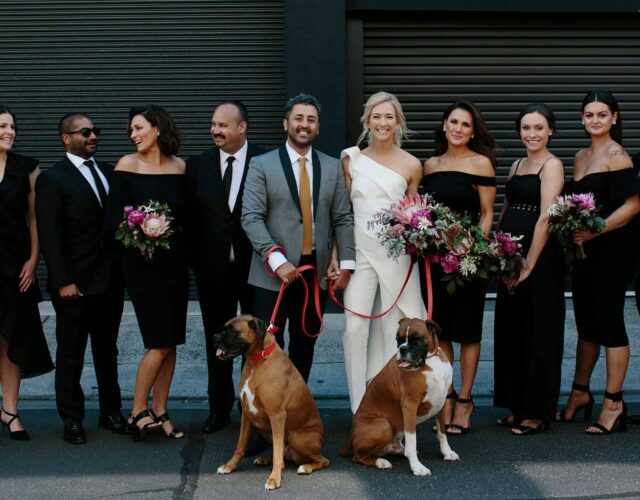 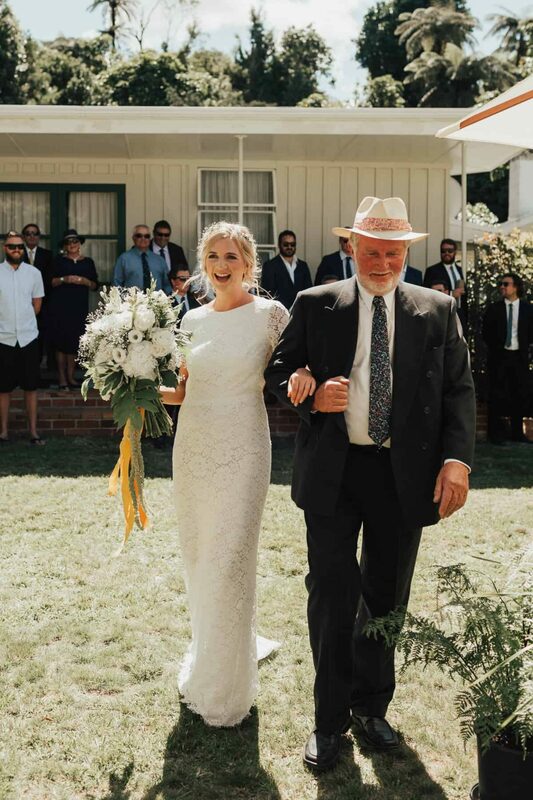 Sophie found her Houghton NYC dress in London boutique, The Lovers Bride, and knew instantly it fitted her comfortable, relaxed and ‘dance all night’ remit. 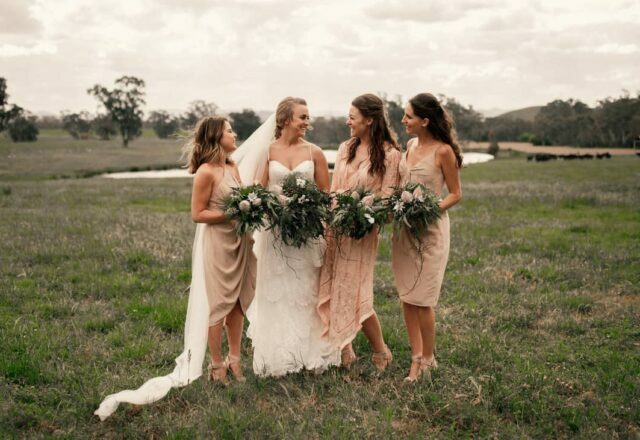 So comfy in fact, she went wakeboarding in it the next day! 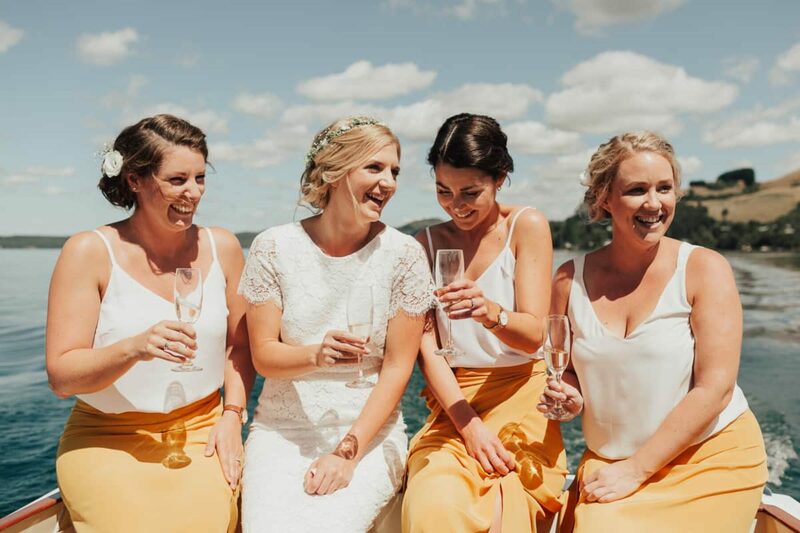 Sophie wanted something bright and summery for her girls, while still being natural. 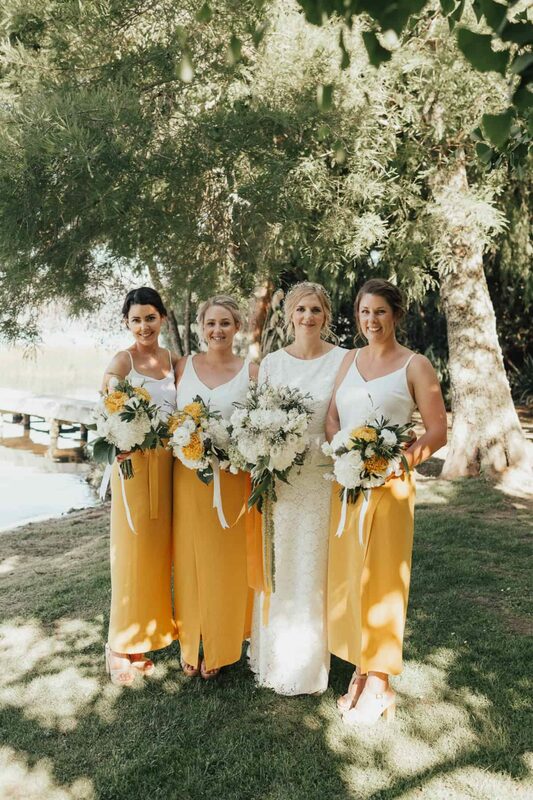 Paired with simple white camis, we think these yellow wrap skirts by Miss Crabb are just the ticket! 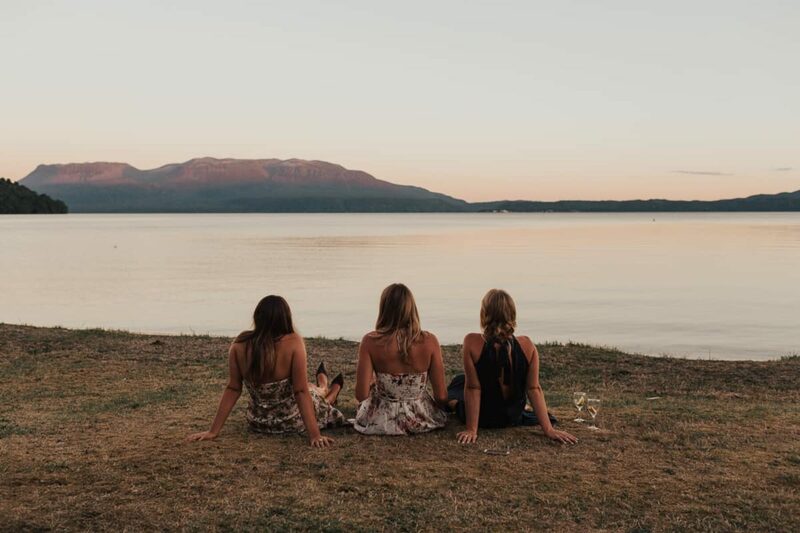 With Sophie planning the day from London, Kim from N.A.W. 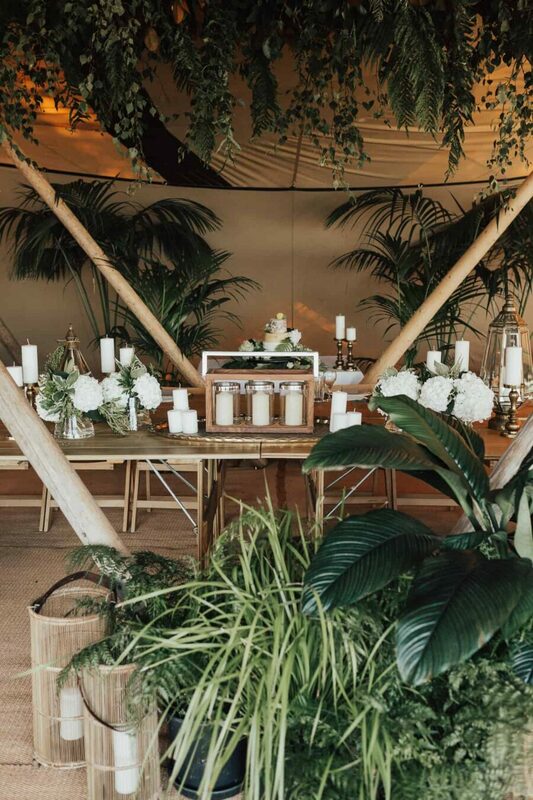 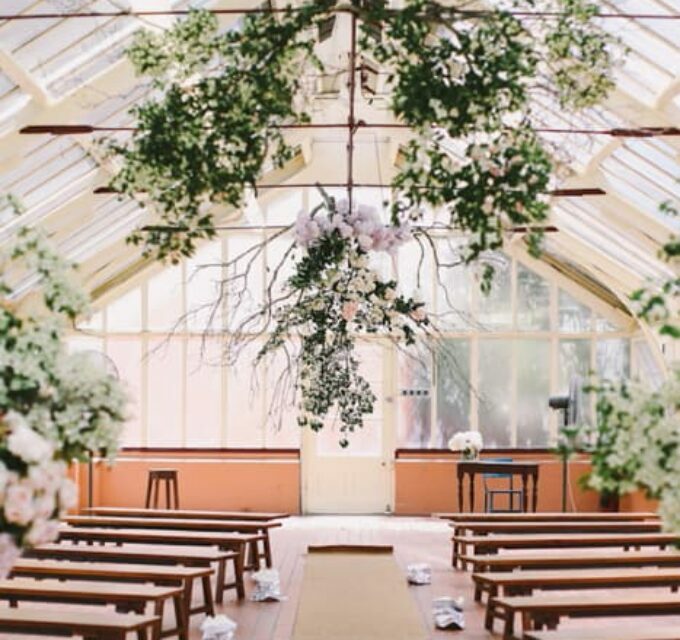 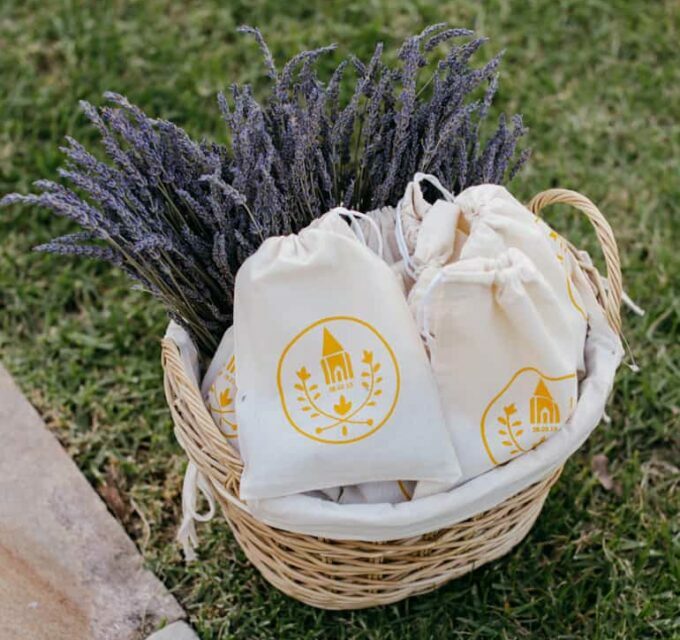 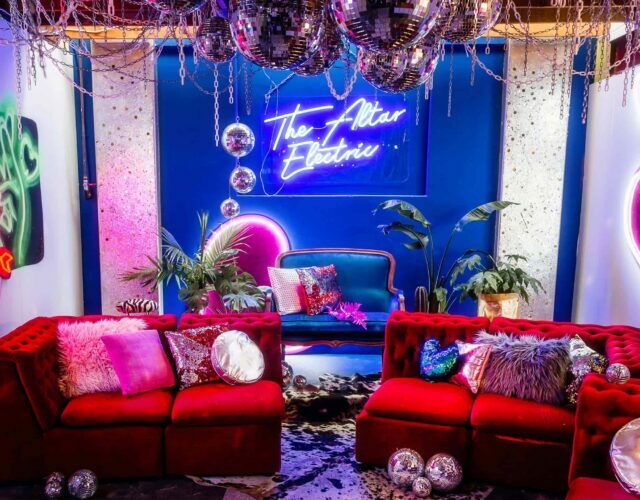 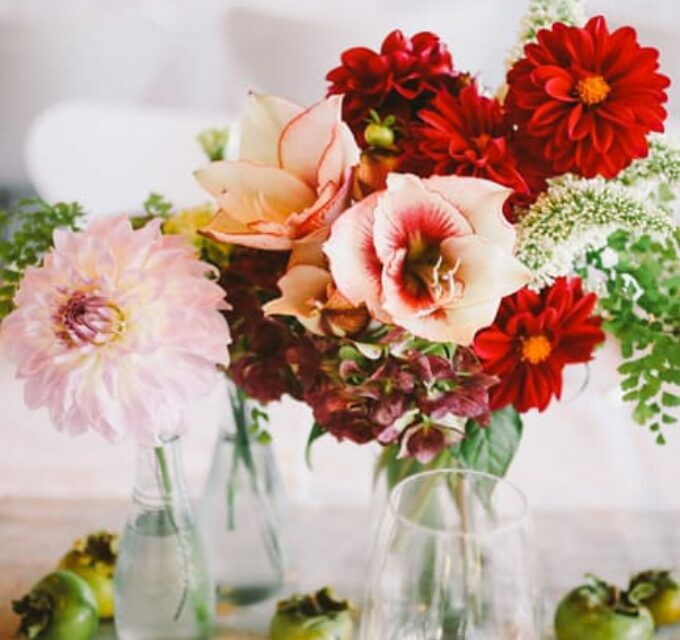 Events stepped in to create a relaxed and natural style with help from The Botanist on the floral front. 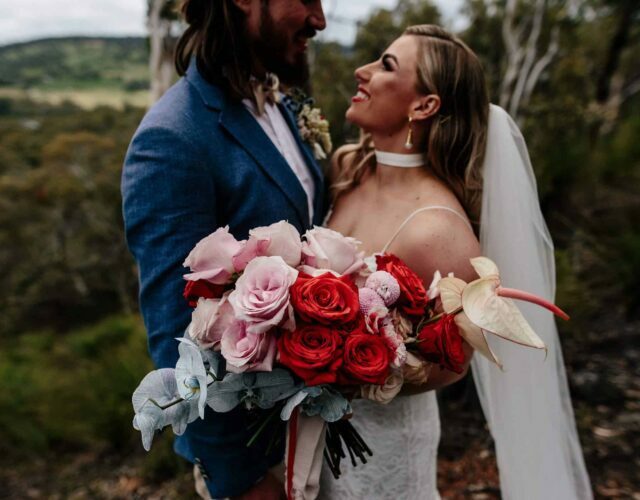 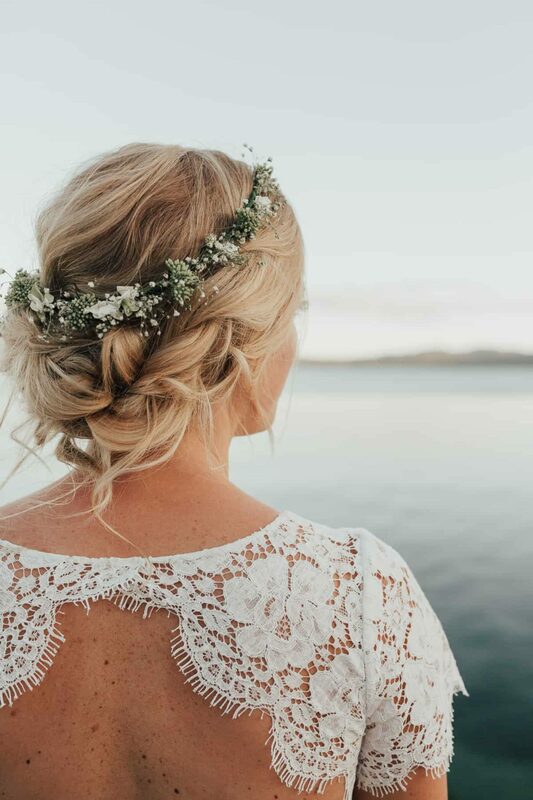 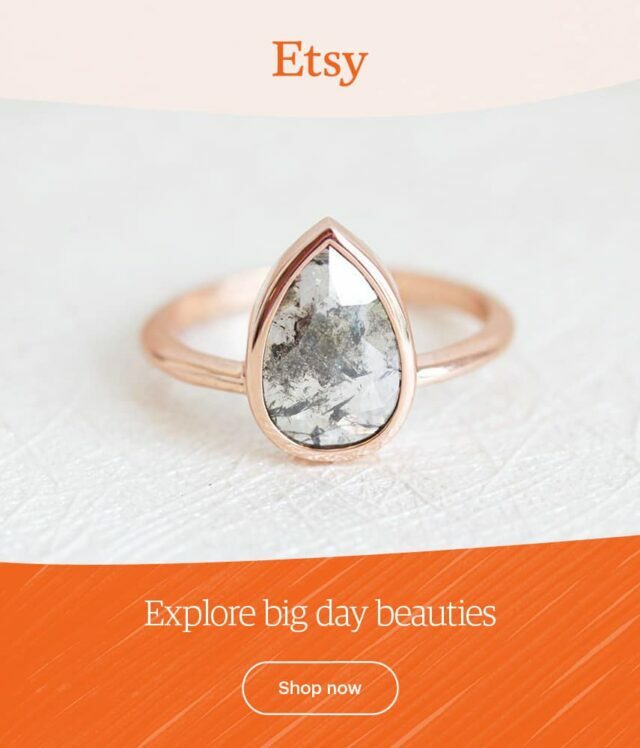 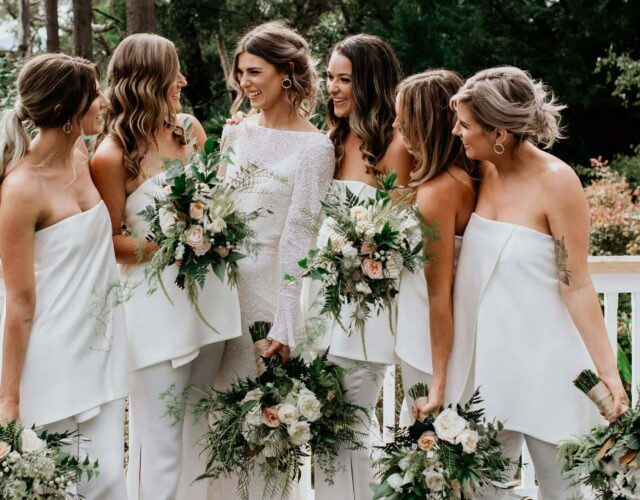 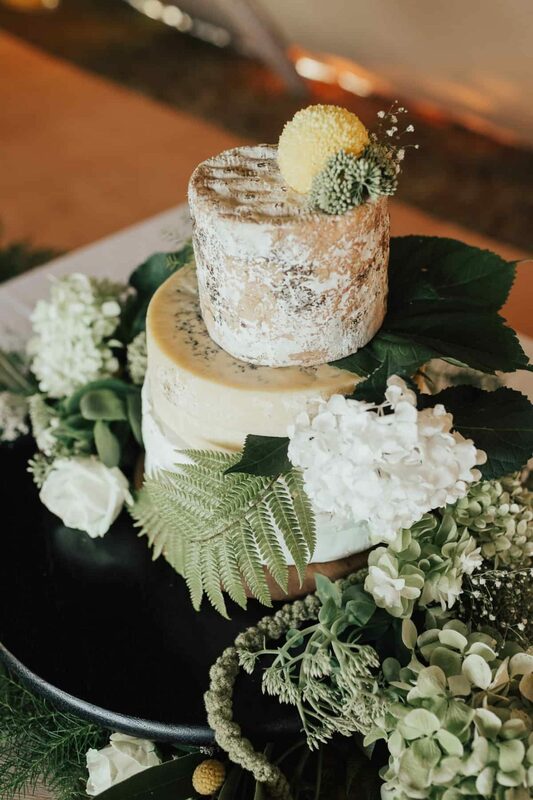 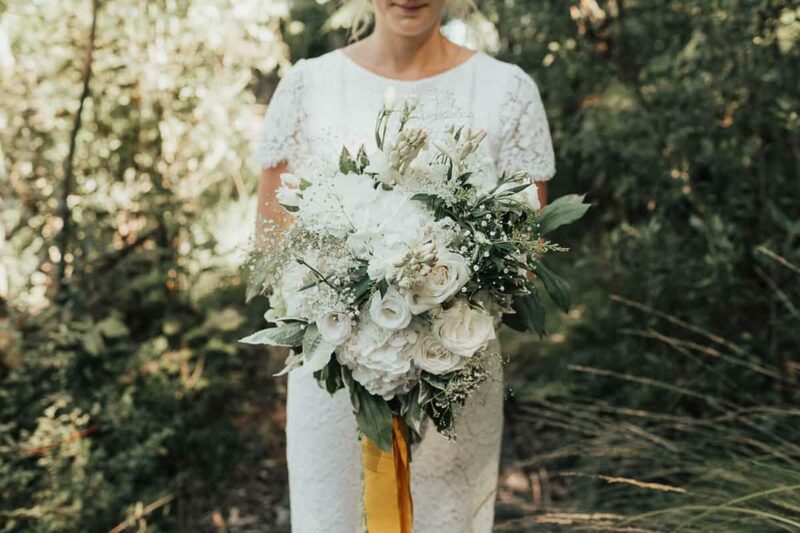 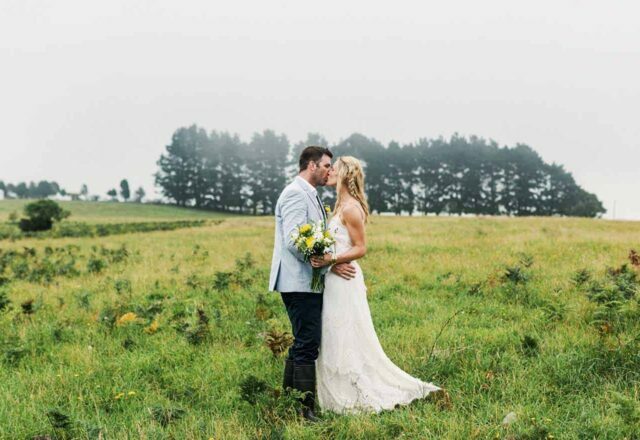 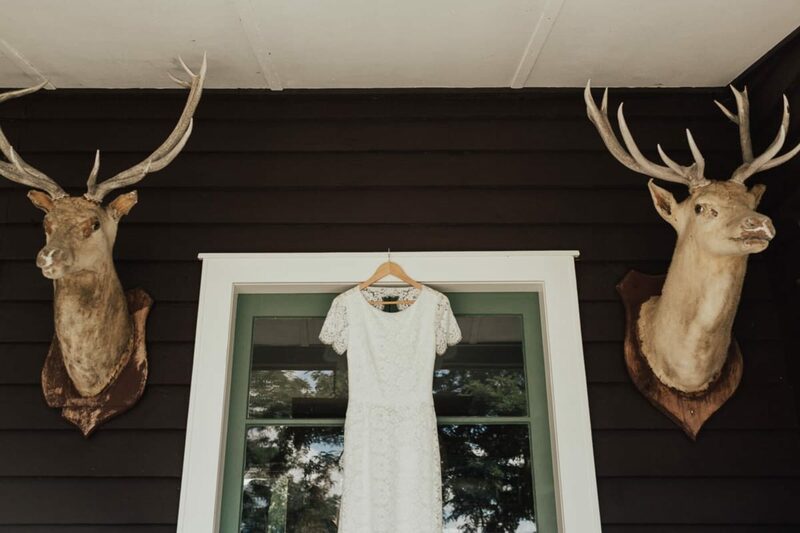 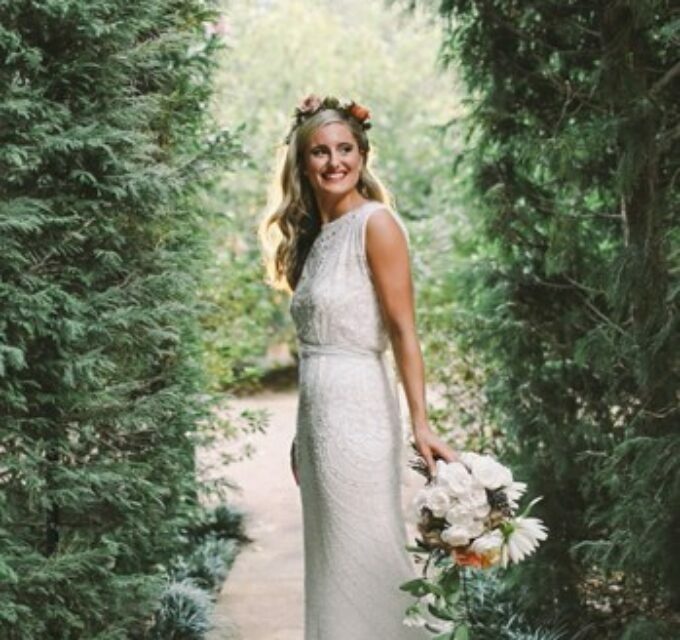 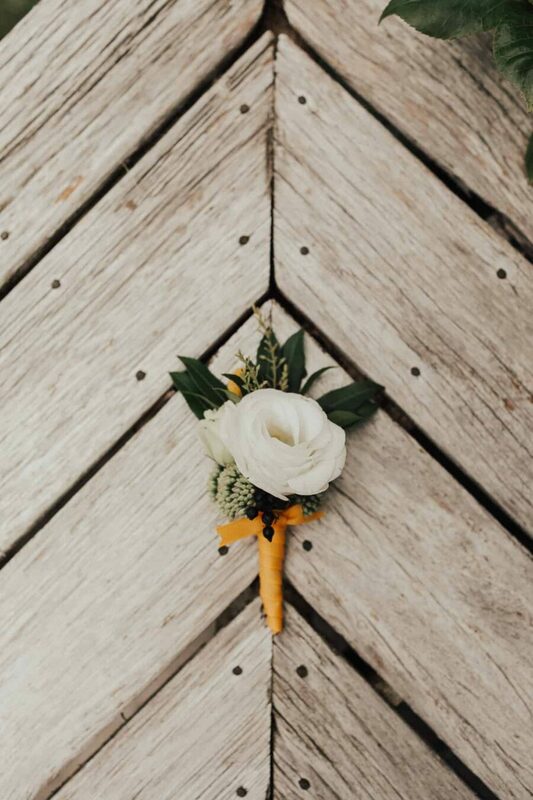 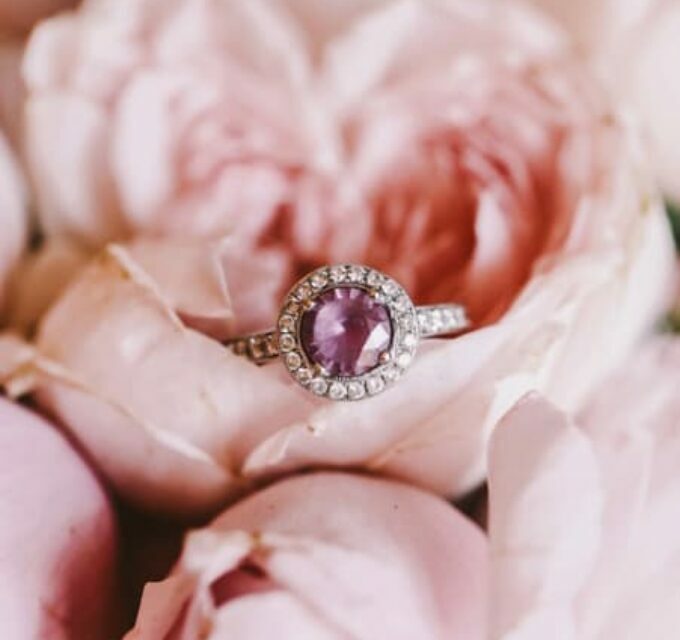 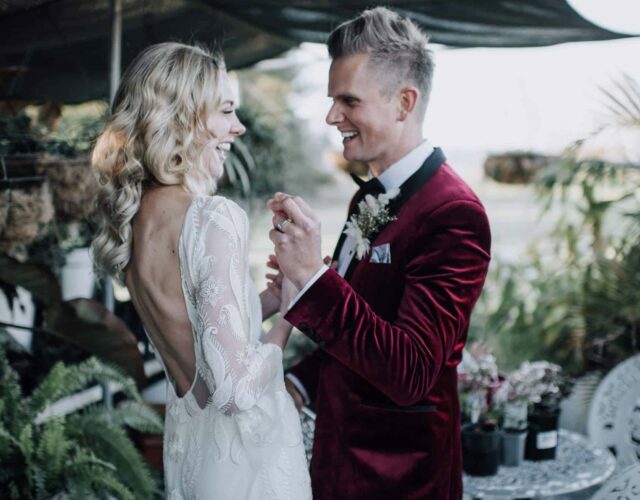 “Kim not only helped me find amazing vendors and ideas for decorations, but she made it all come together better than I could have imagined, right down to putting together all the bouquets and floral features herself”. 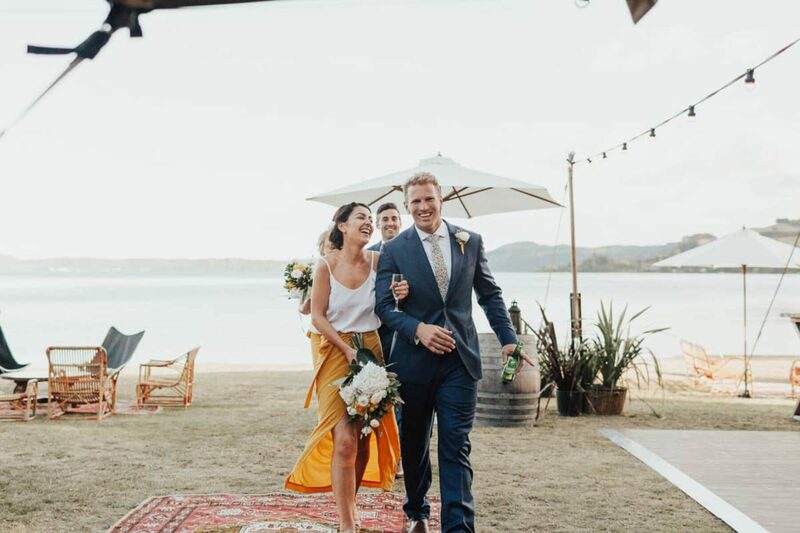 Ben wore a Ted Baker suit with a Liberty floral print bow tie, which fit with the colour scheme and feel of the day; yellow, white and green. 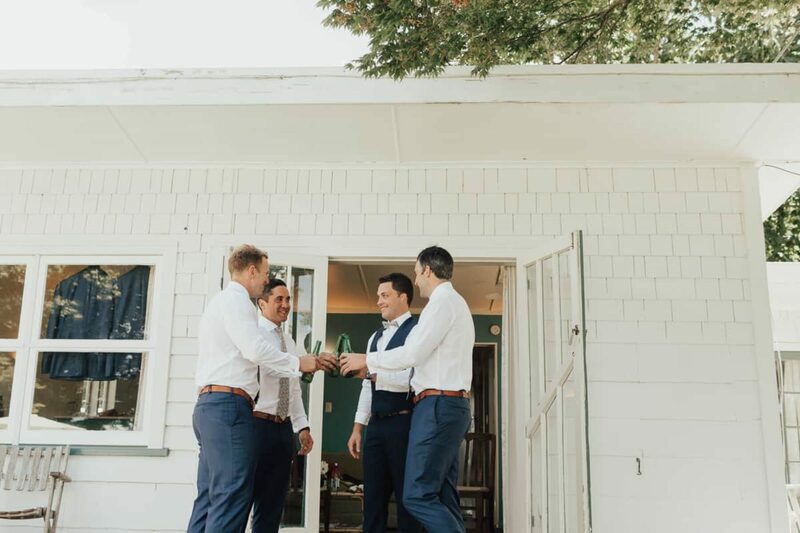 The boys donned the same printed bow ties, bringing a little bit of London along to the day.